Kiitos, kun olet seurannut pulinoitani tässä osoitteessa. Päätin ottaa askeleen eteenpäin ja blogi jatkaa uutta elämää osoitteessa https://pulinas.com. Löydät minut nyt myös Facebookista https://www.facebook.com/pulinasblogi/. Thank you for making this journey with me. I took a step forward and you can now enjoy my stories at https://pulinas.com if you can read some Finnish. Maybe there will be something in English too but at the moment I will stick to my mother language. You are also welcome to follow me in Facebook https://www.facebook.com/pulinasblogi/. 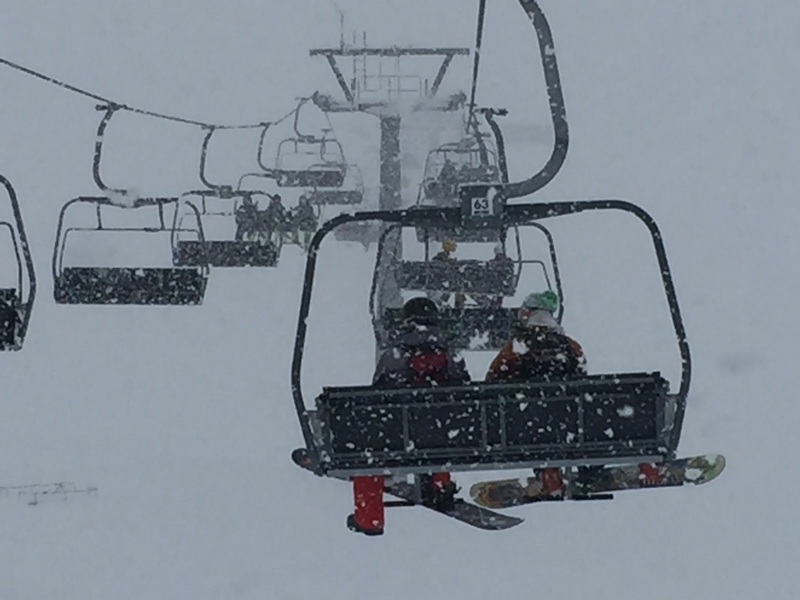 This is not a 1st of April joke that today I have been writing the part 2 for the statement for the skiing season 2016. 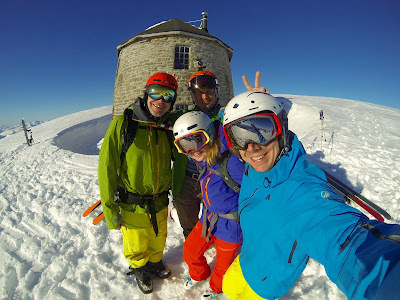 If you haven't read the 1st one, you can check it here Statement for the skiing season - part 1. There has been happening quite a lot in my life lately but I feel super balanced now. Positive things in this moment are that finally I got time to write my blog and I also think I have a great opportunity now to make a plan what I really want to do in the working life as I still haven't win in a lottery. 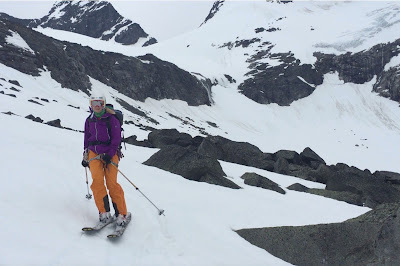 Remembering the past adventures is always a great way to rise up the dreams for the future but it can also cause some serious skiing fever. So what the part 2 is about... Oh Norway, my favourite country Norway. I should really once count the days I have spent in that spectacular country during past 10 years. On spring 2016 it was time for a bit over two weeks skiing trip, with 10 days on skis, 1 real rest day and 4 days travelling. The whole journey turned to be awesome despite quite many change of plans and a lot of driving. Hope you enjoy the ride! Our first plan was to make a dream come true and go skiing to Lofoten. The conditions were unfortunately not on our side. One week before our trip the weather forecast started to look pretty scary, just rain, rain, rain and temperatures over +5 celsius. So did we wanted to still go and check the reality? Did we have a plan B? Not really but we managed to make it pretty fast. Luckily we had a deal that we still could cancel our accommodation in Lofoten and Narvik. 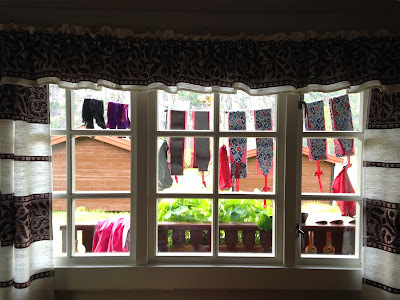 It didn't feel so nice to do it but as we wanted to go skiing the cottage owners totally understood our point of view. Stranda had been already in our minds as an option for that week but we still couldn't find any nice and affordable cottage from that area. After some phone calls we decided to vote for Stryn. One call to our favourite cottage owner at Strynsvatn, a ferry from Turku to Stockholm and soon we were driving towards to the place we used to spend some summer weeks on skis - exiting how it would be in winter conditions! 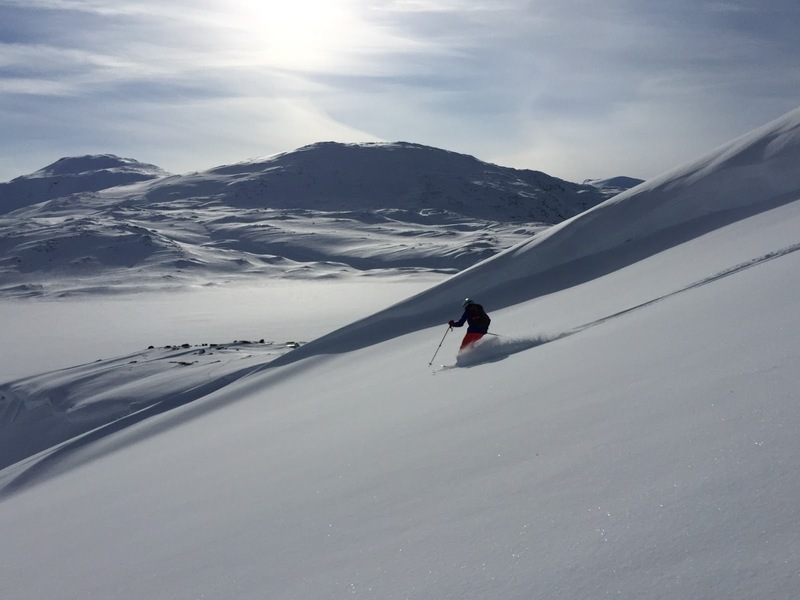 The warm temperatures were also hitting Stryn area but otherwise the weather was on our side with a lot of sun. For sure the the cold nights and warm days made its tricks for the snow but mostly it was just pure joy hiking up and skiing down. Let the pictures talk more than the words. 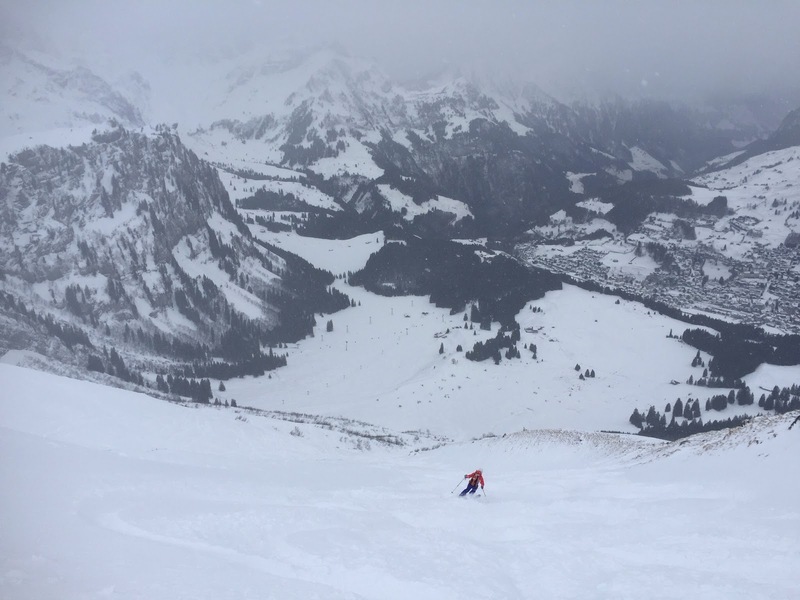 Ski day 1: warm up round in a whiteout, Grotli area. Ski day 2: on the top of Kyrkjenibba 1400 m.
there and back. Kyrkjenibba, Stryn. Ski day 3: kind of rest day hike up to Bergsetnakken 1133 m.
Ski day 4: the big day - up to Skåla. surprised us on the way up to Skåla. Ski day 4: Skålatornet. You could also stay overnight here. Or take a part in a running competition in the summer maybe? 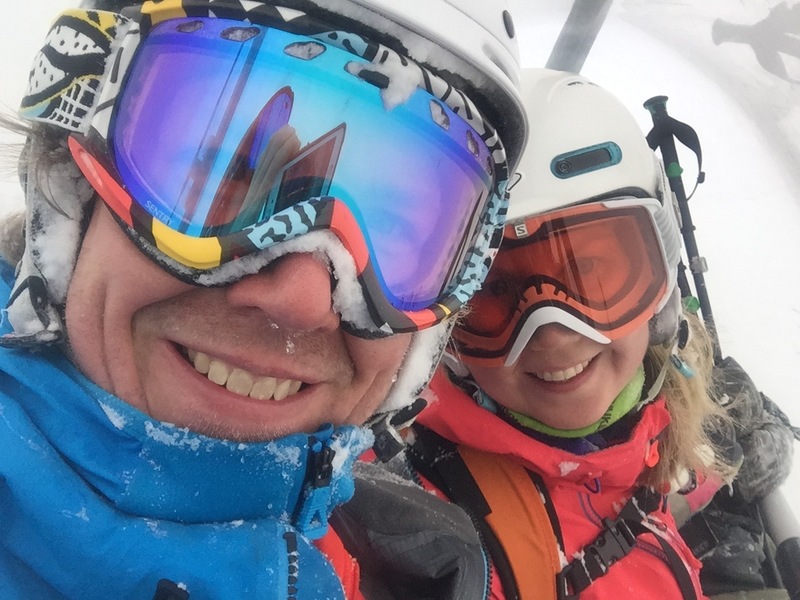 Ski day 4: after hiking up 1800 vertical meters it's easy to smile. I have ever been skiing down. Skåla, Loen. challenges we had on the way. 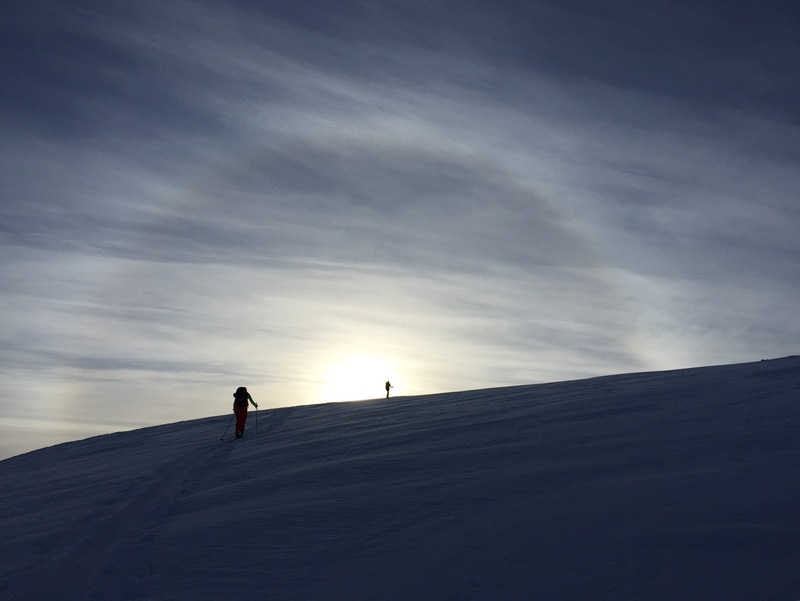 Ski day 5: Over 5000 vertical meters in 5 days checked. and travel enough together. Moods of Norway. Half of the group had to travel back home and we were having some days before we kind of had to be in Northern Sweden. We had booked and payed two nights in advance in the Hotel Riksgränsen as the original plan was to stay for another week skiing somewhere in Northern Sweden or Norway after Lofoten. There was no chance to cancel the hotel room without loosing the money. We had once tried to drive almost the same distance with one stop tactic and I have to say it wasn't so nice travelling. This time we decided to take it more relaxed. First we enjoyed a real day off after skiing for five days and visited an amazing Kråkenes Lighthouse and stunning Refviksanden Beach couple of hours drive from Stryn. The next morning we started it early and drove up to Mo i Rana just to have a good sleep on the way up to north. We got some last minute offer so one night with dinner and breakfast costed only 45 € per person in Clarion Collection Hotel Helma. The next day we drove to Narvik, well rested and eager to explore some mountains again. And meanwhile the bad weather had turned back to perfect winter conditions. If we were already smiling after the first week, the second was laminating the smile on our faces. We hiked another a bit over 5000 vertical meters during that week too and in four different places; Narvik, Riksgränsen, Lyngen and Pallas. Let the pictures tell the story again. 1st day off from skis : Kråkenes Lighthouse. 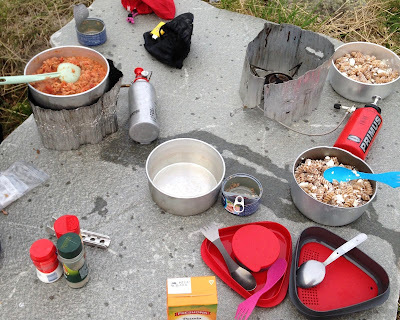 conditions in Spanstinden near Narvik. 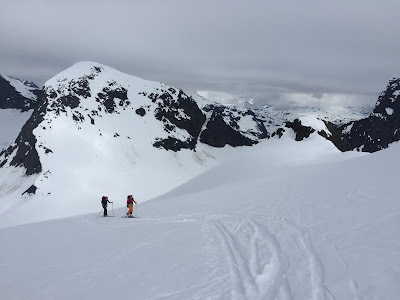 Ski day 6: On the top of Spanstinden 1457 m.
Ski day 6: making first turns in Spanstinden. Ski day 7: hiking up to Nordalsfjäll in Riksgränsen. 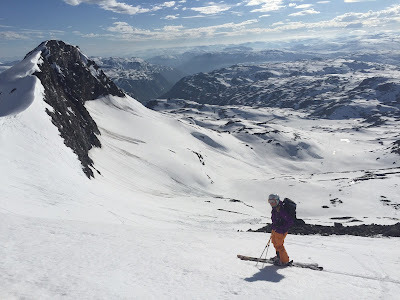 Ski day 7: should I ski in Norway or Sweden or both? on the backyard of Nordalsfjäll. 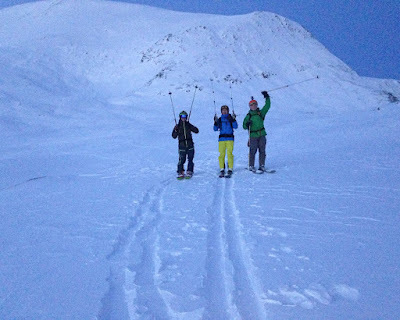 Ski day 8: skiing down from Rassevarri 1166 m, Lyngen. to ski up an down the opposite mountain Perstinden 917 m.
was offering us some Finnish powder with not so good visibility. But it was still worth of it. to say hi again, Pallas. After going through quite many pictures I feel again so amazingly happy that I was able to make this adventure. Just want to thank you all my skiing friends (and our families at home who are always helping and supporting us to to what we love to do) making it best ever before next season that is now going on and haven't been that bad either so far. 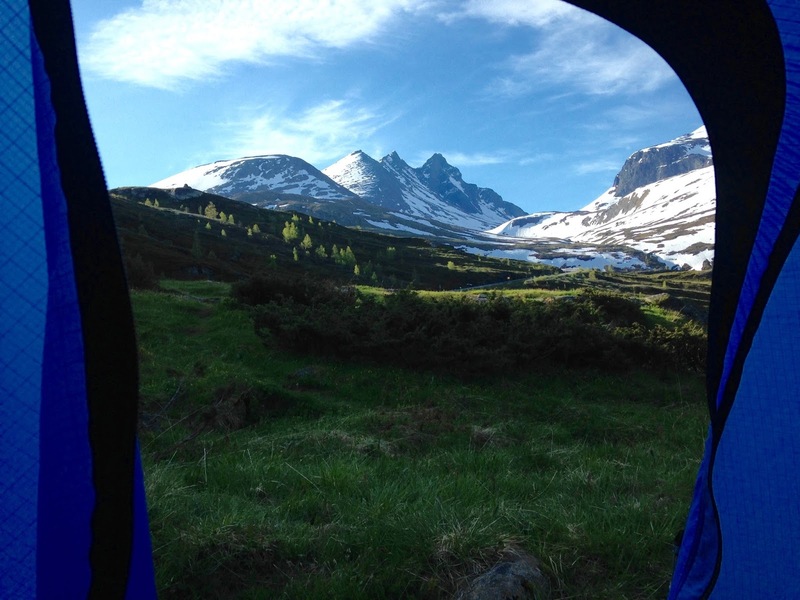 In one week the mountains in Norther Norway are calling us soon again - so see you there my friend! Couple of people were asking me if something happened as I put all my skis on sale some weeks ago. No it's not about that I'm going to quit skiing but after thinking how this season has been its maybe time to give my self a reward and change into a bit lighter gear. And how the season then has been so far? Although this is a statement it doesn't mean it would be already over. You never know what is going to happen in life like last summer. I have a kind of dilemma in thinking when my skiing season really starts or when it comes to an end or is it just on all the time. The springtime 2015 was already pretty good but then I decided that the next one will be even better general in life and with skiing being big part of it. The last turns on our Lyngen trip were quite much defining what we would look forward the next year too. Yes, I understand that in skiing you cannot just decide that how it will be as you are not mastering the weather but I guess positive thinking has quite much power in everything. Last turns of our Lyngen trip in March 2015.
the top on the right. 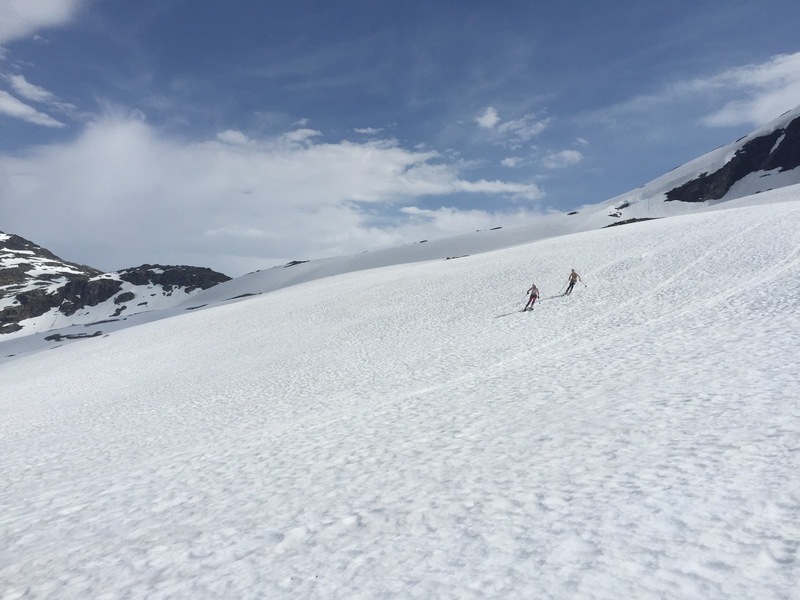 of snow still in end of June 2015.
it was steep and a lot of slush snow. great when you are outdoors. 1st of July 2015, Hurrungane, Norway. on 1st of July 2015.
on 2nd of July 2015. Our cute cottage in Stryn. From June and July 2015 it was kind of the longest break in many years, if not counting my knee injury in winter 2013, in skiing. Usually the season had started somewhere in Finland or Alps before Christmas but this time it was exactly Christmas eve that we had our skis on after the summer skiing in Norway. 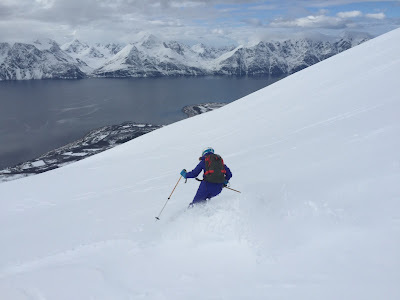 More about the magical end of the year on Lyngen Alps you read in my previous blog writings A kind of magic - part 1 and part 2. My first off piste in Engelberg - The Laub. 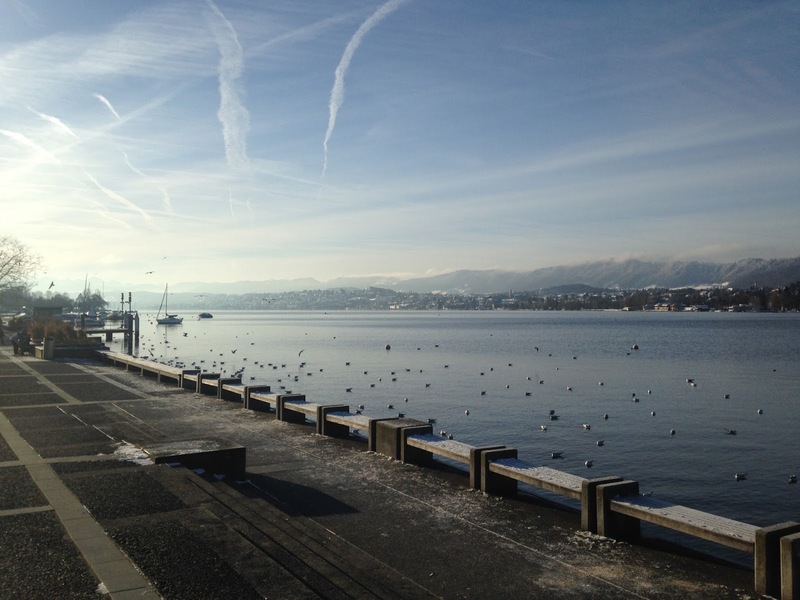 Thank you friends & Switzerland - we will be back! After Switzerland it was time to concentrate to work hard again before the next skiing break in mid-March. Meanwhile waiting to get back to the mountains it was nice to enjoy skiing in the small hills with friends and their kids. 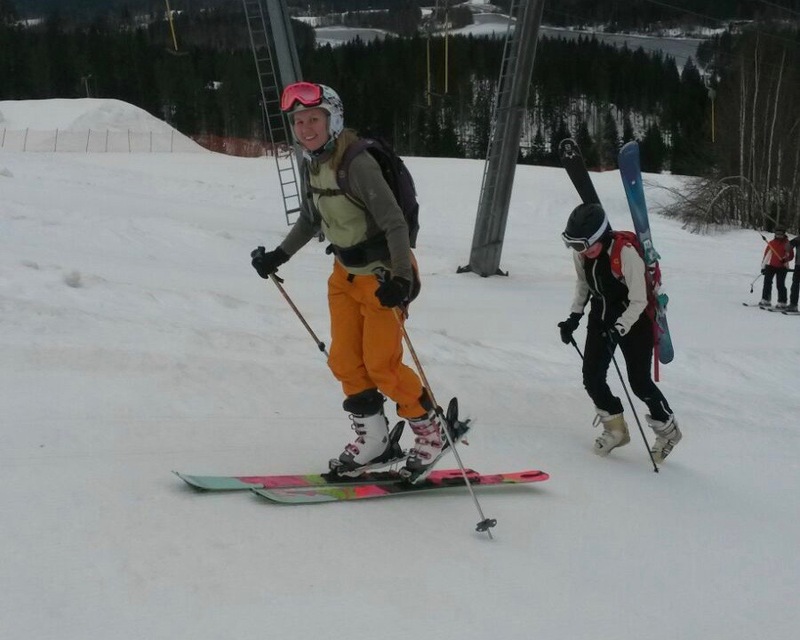 Have to say it was a lot of fun to see the little ones learning to ski. I also took a part in my first ever SkiMo competition in Sappee on 31st of January 2016. Read more about Ski Mountaineering in hiihtoalppinismi.net. It was more for fun for me but for sure once you know its a competition you are at least trying to do your personal best. 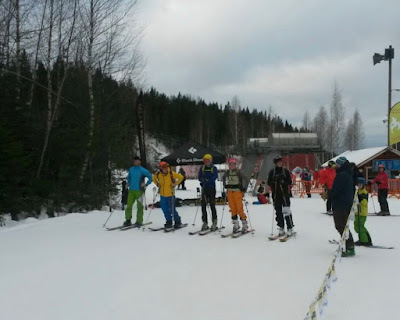 I participated the "toppahoususarja" and we were hiking 4 times up the Sappee hill and skiing down 3 times. I would say that with the shortest legs and heaviest gear I was doing pretty good and my time was 59,31 - so I was extremely happy as my goal was to make it in 1 hour! Well the winner in men's race series competition, Joonas Kortelainen, made 6 rounds in time 33,44. Maybe some lighter gear would make me faster! After SkiMo race I was already dreaming of you guess what... At least lighter bindings but not really any Ski Mountaineering equipment as I have to say I still prefer to do ski-touring in a kind of "peace and quiet" mode. But this was a great experience and as my attitude is like never say never, it might be that I will be competing next winter again just for fun! One of the great days out there - coming more soon! 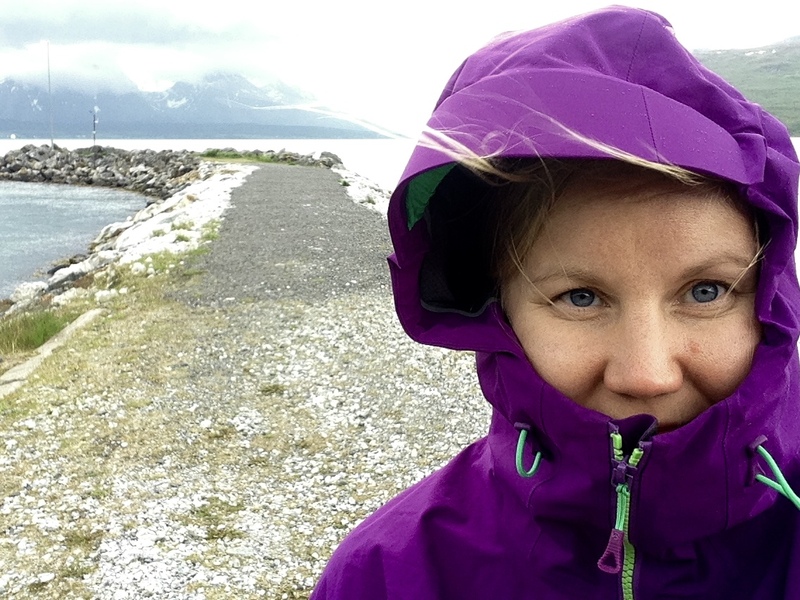 Is it really just a bit over two months we returned from our magical Lyngen trip? I have to say it feels much much more longer time we left one of the most beautiful places on earth. Maybe its also because of the reason that I'm so happy and exited to get back there - at least for a couple of days in the end of this month! After driving back from Tromsø on our rest day we went chilling in the Magic Mountain Lodge's communal kitchen. It was kind of a funny feeling that there were again a lot of new people around. Somehow it gave us the feeling that we had stayed there for much more longer. It was time to make the plan for those two skiing days that we had left. And yes - as I already mentioned in the part 1, the plan was to go on Kåfjord side and take a tour on Giilavarri. After hanging around in the kitchen we ended up chatting with some climbers and skiers from Finland and soon there was one more Finnish split-board fellow to join us for the coming adventure. Six o'clock, how come it is so easy to wake up so early on a holiday. Well it isn't always like that... At least our dog was acting like we are totally crazy people. We decided to have some breakfast before taking the ferry at 7:20 am. It was again pretty nice to just click your skis on in front of the Magic Mountain Lodge and take the road or off-road down to the harbor. We even had time so fix the climbing skins ready before the ferry was about to go. But well well well... There was no ferry going as we were in Norway and it's never normal timetables running during the holiday times although for Finnish people is was just a normal Wednesday. The first ferry would be going around midday or something and it would have a way too late for us. Thanks to the small printed time-table with a tiny note in which was telling the information on the wall of the small harbor cabin we were brought to the reality. So we were more than lucky that we had made a plan B just in case if something with the plan A goes wrong... Fastdalstinden. Roope probably ran to take the car from the lodge and picked us up. 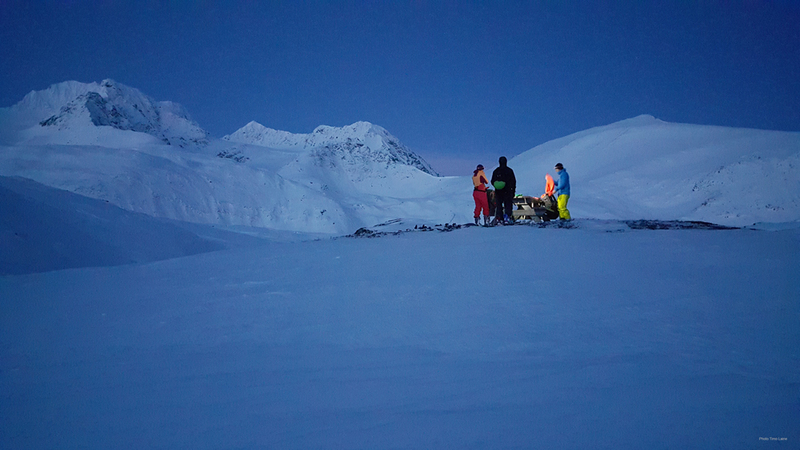 It was only a short drive to the starting point so we were counting to have enough time to be able to reach the summit and ski down most of the way in a kind of daylight. 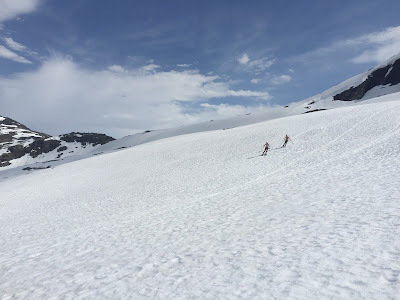 We started hiking up the already familiar track for us in the "powder slope" we had been enjoying couple of days before. Unfortunately it wasn't in so perfect condition anymore. The wind had been visiting the place. But it was so amazingly beautiful and peaceful morning out there. Morning light on the way up. The summit of Fastdalstinden is on the right side. Fastdalstinden... It was looking to be so far away but that was exactly what made it so tempting. In some parts the snow was feeling so perfect and just after couple of meters there was this super annoying crusty surface, "knäckebröd". I was trying to concentrate my mind on the softer parts and convince my self that the skiing down would be super good and fun. 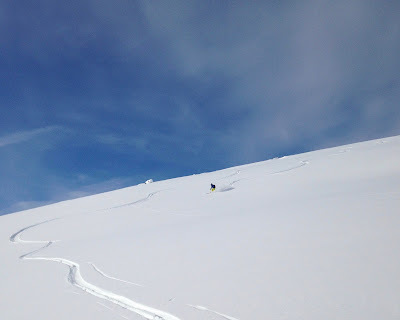 I was also trying to figure out and keep in my mind how the surface of the "good parts" were differing of the "bad parts" so I could try to make my turns on the right spots when skiing down. 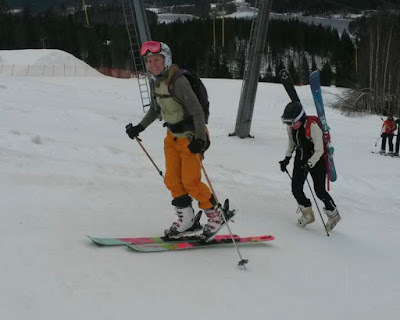 Hahhah... guess if I remembered any of it when I was making my turns. Oh man it was a long way to the top. It felt it was never ending track. I was trying to eat some chocolate and promising my self to have good rest, warm juice and everything up there. During the last meters I realized it would be pretty fast visit on the summit. For the first time on this entire trip the wind was blowing like hell and I was really missing my super warm wind-stopper down jacket. But still it was so beautiful scenery, light and everuything. Nothing was bothering or making my mind worried. I was feeling happy, warm and free inside. The skiing down was way much better that we thought it would be. We split in two groups as I was feeling much more confident to ski down the same way we had hiked up. Well no one of us decided to take down any of the steeper couloirs which were for sure looking super tempting. 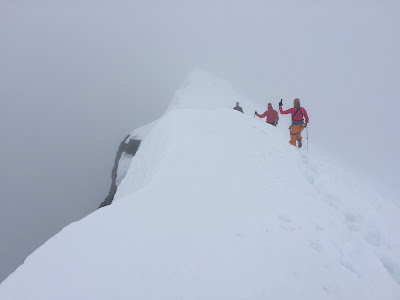 There had happened a huge avalanche on the big wall of Fastdalstinden on February 2015 where one guy died. So it's never stupid to play it safe, too safe some might think, and enjoy the skiing next day too. After skiing down the Fastdalstinden walls there was quite a flat area to ski and it was better to have the skins on again. And then the last part... It was getting dark, I was super tired and having a huge troubles of coming down as it was partly ice, partly snow with this super annoying "knäckebröd" surface. 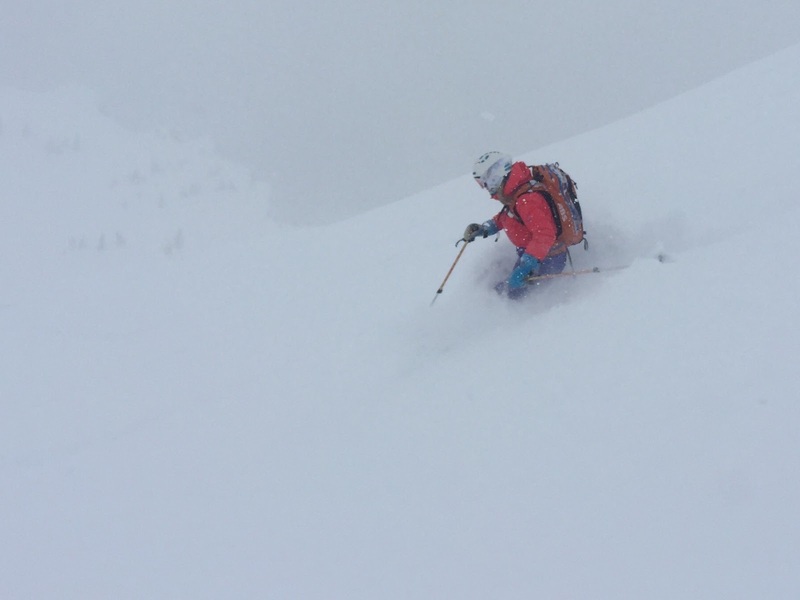 Well thanks to my patient skitouring fellows I made it down safely and even enjoyed the last turns as there was luckily soft snow left in some parts. This was once again a super teaching and kind of relaxing although a tough day out. 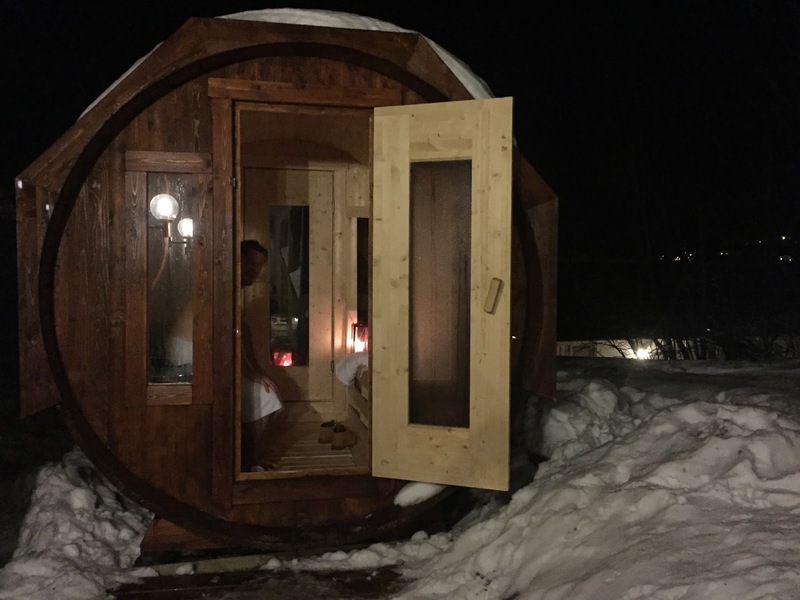 I was just hungry to ski more so it was time rest your muscles in the sauna and decide the program for the last day for this tour and year 2015! Once you get the taste of a soft snow you are ready to even drive a bit further away to get more. 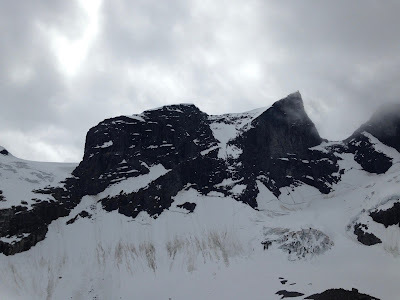 Its for sure would have been nice to go and hike some new mountain for the last day of year 2015 but as we knew that the wind had been blowing really hard, it would have been almost impossible to find even that nice snow than we had on Fastdalstinden anywhere near by. Good bye 2015 - welcome 2016! 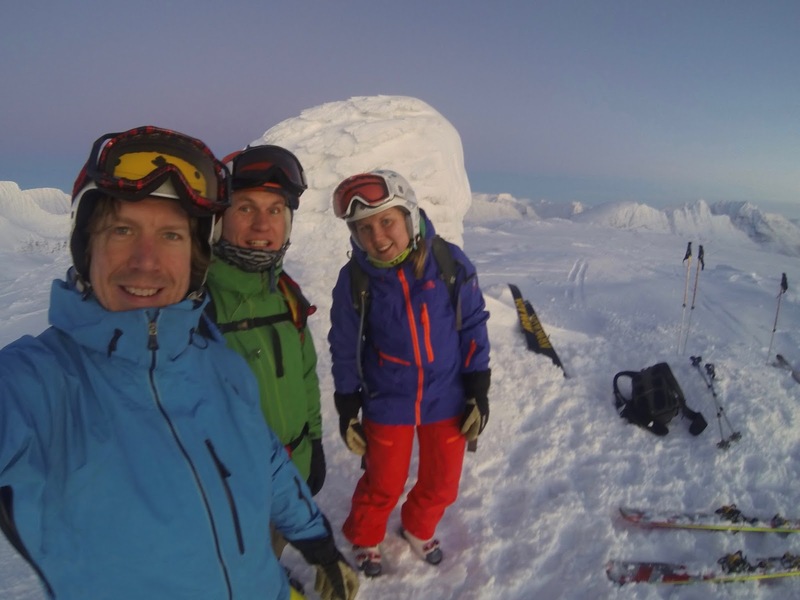 We ended up a plan to have a new tour on Sjufjellet in Tamokdalen. And suprise suprise- there where some other Finns too. This time we were on our way a bit earlier so the plan was to ski down on daylight this time. And wow, it was so much more better weather compering to Lyngseidet too and for the first time we really saw the scenery up there! We were also lucky that the other visitors on that day were skiing already down when we were still hiking up. They hadn't even went to the real top and there was a whole untouchable powder field in the upper part of the mountain waiting for us to ski down. Not a bad way to finnish the year 2015! The only thing we had been missing on this trip was more powerful headlamps. And what was quite close to happen would have been maybe already too much... 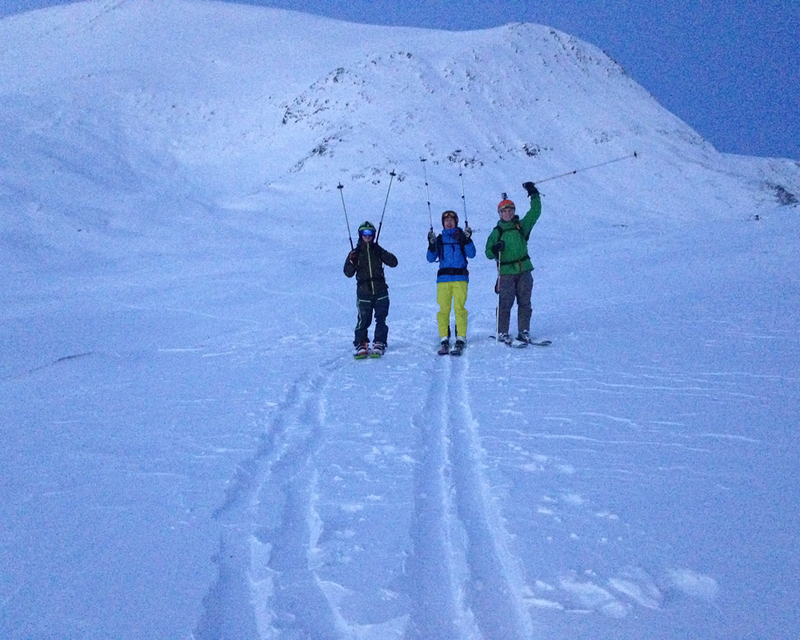 Skiing down while northern lights were dancing and a whale jumping in front of us in fjord. Well as Simone Moro told me... Pauliina - Never stop dreaming. And I won't and I can honestly say the start of year 2016 has been more than a dream to me. I feel alive again after suffering of quite bad tiredness during year 2015 and more balanced with my life - maybe ever. Happy ski! Thanks to all our gear too for a great trip! Happened in January 2016 - Coming soon! Olen Pulina S. - kolmekymppinen nainen, jonka perheeseen kuuluu mies ja koira. Viihdyn lumella, vuorilla, tasamaalla, meressä, maalla, kaupungissa, minne ikinä voinkaan matkustaa. En tiedä pulisenko oikeasti niin paljon, mutta blogissani kerron asioista, jotka minua liikuttavat ja minne. Tervetuloa mukaan mun pulinoihin niin arkena kuin lomalla!